People who are good listeners can simply have a more profound effect on people in their personal and professional lives. They are able to relate better to people as well as create a sense of trust. 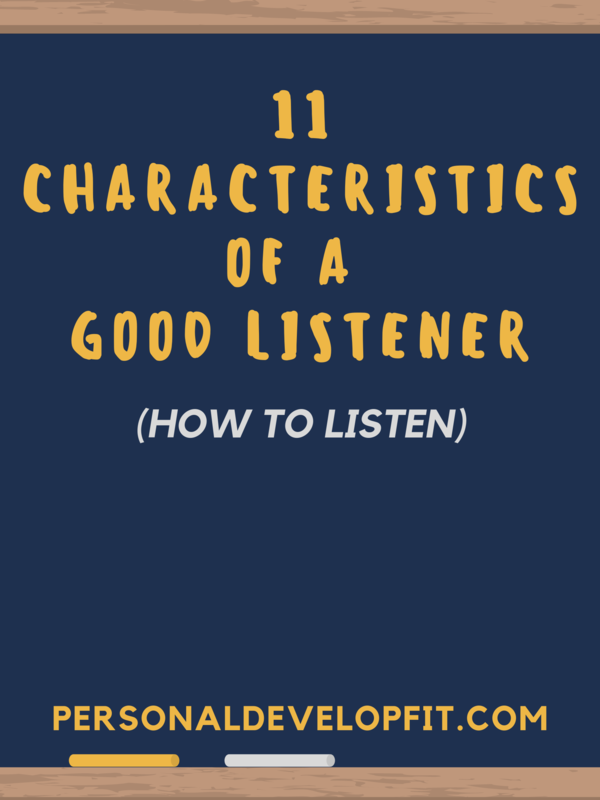 But you may be wondering what the characteristics of a good listener are because you want to be come one. 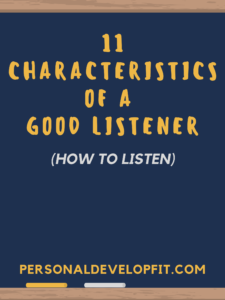 Well below, I offer you 20 different ways to become a better listener so you can start making a big impact in the daily interactions you have. There is a great article called “Eye Contact is a Powerful Listening Tool” talking about how we can use eye contact to be a great listener saying that it is just as important as listening. They talk about how it can be a bit awkward to stare for long periods of time thought. But the solution is what they refer to as the fishhook technique. You use this technique by looking diagonally with your right eye at your clients right eye, or vice versa, essentially hooking your eye with his/her eye. This is a type of eye contact that we can maintain for longer amounts of time without seeming like we are just staring. A great article called Body Language of Listeners saying that we should first off, not multi-task when listening. Don’t give into the temptation of checking things like your watch or phone. Turn your head and torso to face them. You can also use the great non-verbal cue of leaning forward towards them which shows you are engaged in what they are saying. A couple other tips the author offers are to nod your head which they say is the universal sign that you are listening. As well as to open up your body which shows that you are receptive to that person. Avoid crossing your arms or legs if you are seated. Open up your palms, exposing them or simply resting on something in front of you. Lastly, you should smile more often which shoes that you are trustworthy as well as approachable. It influences the responses you get and gets other to warm up by smiling back at you. I have learned that simply pointing your feet towards the person will allow you to signal to the person that what they are saying is important and that your attention isn’t diverted. Repeating what people are saying in their exact words can come off like you are talking to a parrot. But there is a better way, discussed in a great post called Reflective Listening Statements, talking about how we need to use our own words to reflect back what the person you are talking to is saying. Erica: I’m quite sure that Sam loves me, but he doesn’t put in a ton of heart and effort in celebrations like our 2nd year anniversary! Jen: So what I hear you saying is that you feel unappreciated and want Sam to be more thoughtful and chivalrous with your big dates. (Reflecting Content) – Using the words: sure, go on, uh huh to show the person that you are following along with what they are saying as well as understanding it. (Reflecting Feelings) – When the person you listen to is verbally expressing a feeling they have, reflect those feelings back to them. Essentially feel their pain. (Reflecting Meaning) – Looking for the deeper meaning from what the person your talking to is really trying to portray. Essentially looking beyond the surface level of what they are saying and extracting what they really mean. She talks about how the next time you have a conversation with someone, with all your effort focus completely on what they are saying, then really think before you speak. You do this by pausing to find out what the most important thing you need to say as well as consider why you are saying it. This will allow you to speak from a place of connection not just to hear themselves speak. She also talks about putting yourself in the others persons shoes even if you disagree with them. This comes from a compassion as you are seeing it from their perspective. Also utilize sumarization of what people are saying to show that you have been taking in all that they are saying. Lastly we need to challenge ourselves to wait before responding and pushing past the awkwardness that comes with it. Counting to 3 can give you enough time to do this to see if they are truly done speaking. A great listener does so by being mindful. Mindful listeners are able to retain more of what they hear versus people who are distracted. They don’t look over peoples shoulders or what is going on around them for a better stimulus. They are purely present from moment to moment. A great article called the skill of mindful listening talks about how using mindful listening is done with a spirit of non-judgement and receptivity. The article talks about redirecting your attention back to what the speaker is saying when you mind is wandering, similar to what we do in meditation when we are distracted. Listen to the person carefully, being receptive of what they are saying. If you interrupt them, simply apologize and go back to being mindful with the conversation. When we utilize mindful listening, we are displaying a high level of empathy which gets us out of ourselves and soley focused on the other. This can be difficult, as the author says, when it comes to a disagreement. But with practice it will help us get out of our own way and not react in a bad manner. Like with mindful meditation, you try not to judge anything during the process. This makes the process more effective which you can apply the same tool to mindful listening so that you conversations will flow smoothly, the other person will not feel judged, allowing them to feel safe in your presence and open up enough to build great rapport and strong relationship. Tony Robbins is a huge advocate of this. But mirroring is an excellent non-verbal technique that you can use to show that you are an awesome listener. This allows us to build rapport with anyone. Even people who aren’t of the same ethnicity. By mirroring and matching someones, looks, gestures, emotions and even tone and pitch of their voice, we allow them to feel automatically comfortable with us. If they scratch their face, we touch our face or put our hand through our hair shortly there after. If they cross their legs, so do you. If they clear their throat, you do the same shortly thereafter. We don’t mirror and match every single move, but by doing so with a good amount of what the other person is doing, we enter in a deeper connection in the conversation. Tony Robbins talks about how it was first developed by a man name Milton Erickson. He knew that we have a mind and a subconscious mind, which our subconscious mind is massively more powerful. For example this mind makes our heart beat 100,00 times a day. He noticed that when people got into rapport the were mirroring each other. He made the conclusion, which is what we all know, that people like others who are like them. Or how we would like to be. We can become more like people instantaneously by mirroring and matching them, allowing us to build rapport with virtually anyone. Tony talks about how physiology is 55% of communication, where as our words only consist of 7% of how we effectively or don’t communicate. Here is the full video of Tony Robbins talking about this. For example we may not agree with a persons religious views, but it shouldn’t stop us from receptive and listening. Seeing things from other peoples point of view can be massively effective with good communication and listening. We should approach each conversation from a place of wanting to grow. This will allow us to be more effective listeners and communicators. When we come from a place of curiosity instead of judgement, we show the person that we want to learn from them and they are safe to share conflicting point of views without being attacked. If you and I can act like children and be curious about our conversations, we can make anyone feel welcome in our presence, and show people we are truly listening. They don’t have to be verbal. A nod or a simple raise of the eyebrow can suffice. Keeping the tone of our questions gentle in order to avoid seeming intrusive, controlling or critical. You can also ask if it is ok if questions are welcomed. Slow your voice down when you are asking questions. Persist with more questions that help you get a clearer answer. Or simply state that you are unclear and ask them to elaborate. How do you feel about that? Or how did that make you feel? I hear you saying this, do I have that correct? How can give them my support in the best way possible? Are they giving me any non-verbal cues? Often times we want to be the source of solving someones problems or providing the perfect words to make the person feel better when they come to us with a conversation. A great article called “How one simple change can make you a better listener” talks about how people come to us with a problem but it is often something deeper. If we jump in too quick, as the article states, we may be treating the symptom but not the root cause. To get away from this habit by gauging how deeply someone cares about what issue is being discussed. More importantly how much the issue has actually been dealt with so far. Once you evaluate, then you can ask better questions and listen to the person to help them solve the issue. Or simply just listen to them because they want to vent. Lastly, it is said that we should use a 2:1 ratio with our talking. Simply twice as much as we speak. Using this rule can help us be better listeners. When it comes to the importance of listening, it really comes down to having an impact on people. You will have an impact on people regardless of how good, or bad of a listener you are. But if you are a good listener, you will be more attractive to the person you are talking to, both visually and intellectually, as well as be able to influence people in a more positive way. You will be known as a good conversationalist and someone that can be trusted. We all remember that person who truly listened to us and reflected back to us what we were talking and feeling. They just “got” us. Well becoming a good listener will allow you to be this person to countless individuals. It will make you have a bigger impact at large, which will translate to more love, happiness and financial success. People love people who listen to them. This will allow you to get almost anything you want in this life. Because true listening is a form of unconditional love. Which when you display this act, love will come back to you. This is the law of the universe. What you give out, must come back.